Kiddos Cook with Local Chefs! 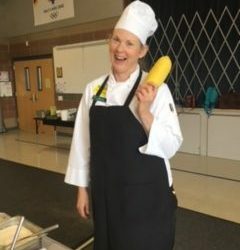 Hundreds of Park City kids are learning cooking skills, tasting healthy food and working with local chefs in the After-school programs at all elementary schools this year. Above, students made Chicken Tortilla Soup, one of the made-from-scratch menu items offered this year. Local Chefs enjoy spending time teaching kids their trade. 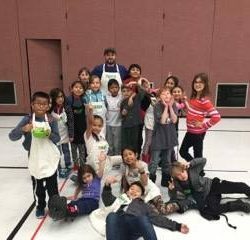 This past fall, chefs from local restaurants and private chefs came to all four elementary schools to have fun while showing students how to make their recipes. 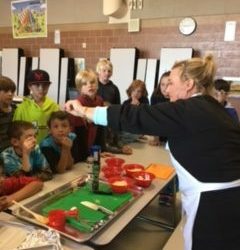 Deer Valley, Squatters and private chefs all shared their talented culinary teams with EATS and the After-school students. The volunteer chefs are rewarded with energized faces soaking in their words of wisdom and hearing the kids’ quippy comebacks. 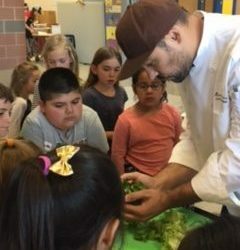 At Parleys Park elementary school, Chef Marcelo from Squatters was asked when he demonstrated how to cut open an avocado, “What do you do with the bone?” Now that takes the cake! Hats off to the EATS Cooking Class Coordinators, Leah Morisi and Claire Hall, put it all together for the kiddos! These ladies rock! EATS would like to thank all the generous sponsors of Cooking Classes for Better Health. The program expansion would not have been possible without all these contributors! Cooking Classes for Better Health (CCBH) are held on Friday afternoons and volunteers are needed to help guide the students’ activities in the class. If you would like to help, please complete our volunteer form or contact us at eatspc@gmail.com.